Notes for Mechanical properties of Solids chapter of class 11 physics. Dronstudy provides free comprehensive chapterwise class 11 physics notes with proper images & diagram. Matter is usually classified into one of the three states or phases: solid, liquid, or gas. Because they can flow easily, both liquids and gases are called fluids. A solid has a fixed shape which it tends to retain, whereas fluids have no fixed shape. A liquid sinks to the bottom of its container, and a gas expands to fill the available volume. The atoms in a solid vibrate about fixed equilibrium positions, whereas the atoms or molecules in a liquid move about relatively freely and collide frequently with each other. The atoms in a solid or liquid are quite closely packed, which makes it difficult to reduce their volume, they are almost incompressible. On the average, the atoms or molecules in a gas are far apart, typically about ten atomic diameters at room temperature and pressure. They collide much less frequently than those in a liquid. Gases in general are compressible. The precise definition of stress depends on the particular situation being considered, but in general it is a force per unit area. The strain indicates some fractional change in a dimension or volume. The unit of stress is N/m2, whereas strain is a dimensionless quantity. If the deformation is small, the stress in a body is proportional to the corresponding strain. This proportionality constant Y is called Young's modulus for the material. It is constant for a given material. 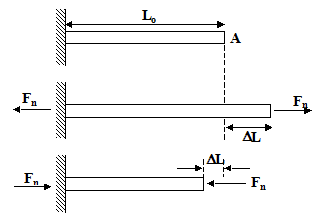 Forces acting in the opposite direction, as shown in figure, would produce a compressive stress. 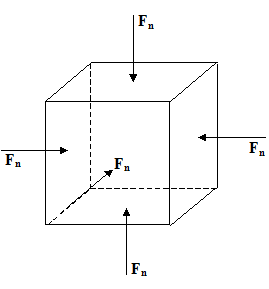 The resulting strain is defined as the dimensionless ratio. A metal wire 75 cm long and 0.130 cm in diameter stretches 0.035 cm when a load of 8.0 kg is hung on its end. Find the stress, the strain, and the Young’s modulus of the material of the wire. A solid cylindrical steel column is 4.0 m long and 9.0 cm in diameter. What will be its decrease in length when carrying a load of 80000 kg? Y = 1.9X1011 Nm-2. where A is the area of the surface. where y is the separation between the top and the bottom surfaces. A box shaped piece of gelatin dessert has a top area of 15 cm2 and a height of 3 cm. When a shearing force of 0.50 N is applied to the upper surface, the upper surface displaces 4 mm relative to the bottom surface. What are the shearing stress, the shearing strain, and the shear modulus for the gelatin? The bulk modulus of a solid or a fluid indicates its resistance to a change in volume. The SI unit of pressure is N/m2 and is given the name pascal (Pa). Pressure is a scalar because on any infinitesimal volume, it acts in all directions; it has no unique direction. The negative sign is included to make B a positive number since an increase in pressure ( p > 0) leads to decrease in volume ( V < 0). Obviously, work has to be done by the applied force in deforming a body, to whatever type of strain it might be subjected. This work done or energy spent remains stored up in the body in the form of elastic potential energy or strain energy. Let us calculate the work done in case of longitudinal strain. or , where l is the total change in length. Since volume of wire = LA, we have work done per unit volume or strain energy per unit volume = 1/2 x Stress x Strain. If the ends of a rod are rigidly fixed so as to prevent expansion or contraction and the temperature of the rod is changed, tensile or compressive stresses, called thermal stresses, will be set up in the rod. Hence in the design of many structures which is subject to change in temperature, some provision must be made for expansion to avoid failure of such structures. Suppose that a rod at a temperature T has its ends rigidly fastened and that while they are thus held, the temperature is reduced to a lower value To. If one end of rod or wire is rigidly fixed and a force is applied at the other end, it will stretch. If the force is small, the extension will also be small and upon the withdrawal of the force, the wire will regain its original state. But if the applied force is gradually increased, after some intermediate states, a state is reached when the wire or rod breaks. The stress corresponding to this breaking point is termed as breaking stress. The stress-strain graph of a ductile metal is shown in figure. Initially, the stress-strain graph is linear and it obeys the Hooke’s Law upto the point P called the proportional limit. After the proportional limit the graph is non-linear but it still remains elastic upto the yield point Y where the slope of the curve is zero. At the yield point the material starts deforming under constant stress – it behaves like a viscous liquid. 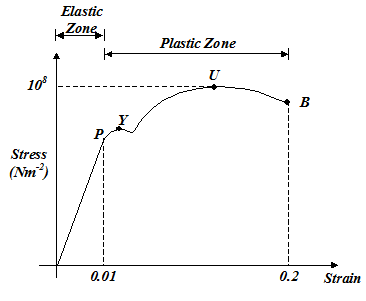 The yield point is the beginning of the plastic zone. After the yield point, the material starts gaining strength due to excessive deformation and this phenomenon is called strain hardening. The point U shows the ultimate strength of the material. It is the maximum stress that the material can sustain without failure. After the point U the curve goes down toward the breaking point B because the calculation of the stress is based on the original cross-sectional area whereas the cross-sectional areas of the sample actually decreases.